Disclosure: I received this item for review from the manufacturer at no charge. This site also displays ads for the manufacturer when served by our advertising agency. 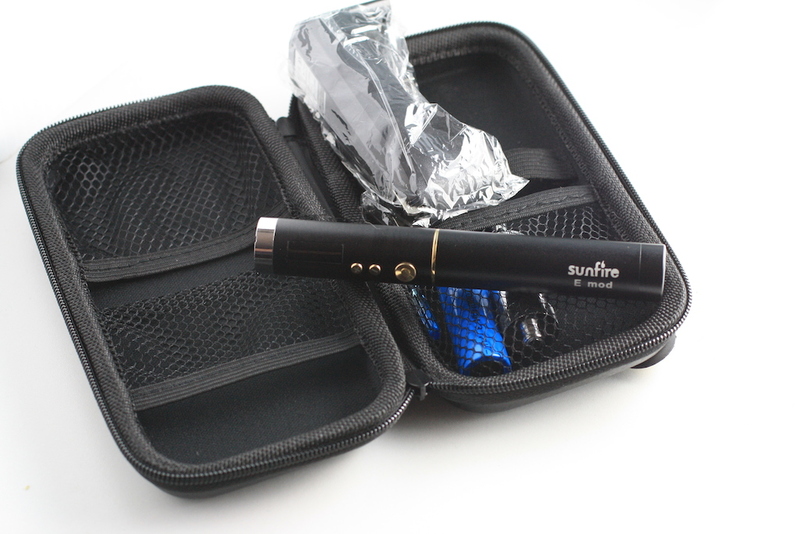 The first thing that hit me about the Sunfire E Mod when I opened the soft-sided zippered case it comes in was the battery. It’s a 16650. Yes, 16 and not 18. It’s kind of an odd battery size, but it has the net benefit of making the E thinner than other APVs that rock the typical 18650 batteries. Beyond the weird battery, the kit included the full compliment of things you need to get started including a charger and an adjustable airflow bottom coil tank. This body consists of three parts. There is the end cap, a battery tube and the head which contains the display and buttons. The top of the control head features a flat top with a 510 connection. 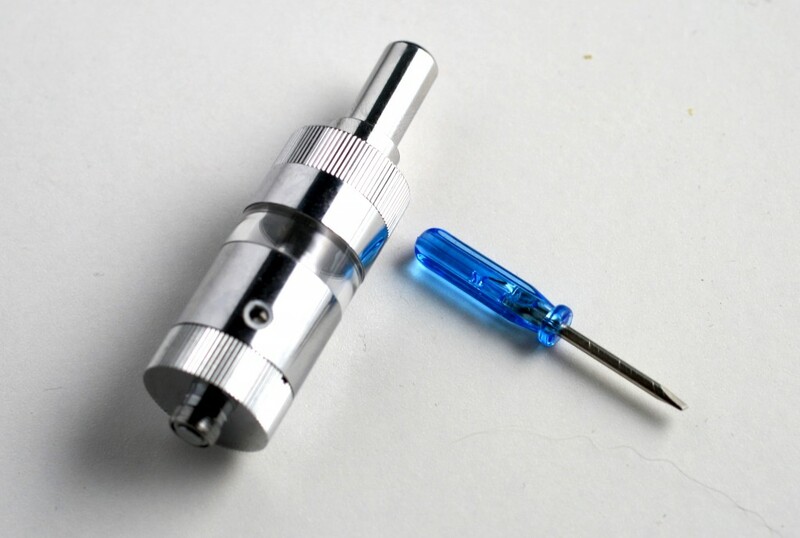 Unlike many competing devices this one does not feature an eGo connector, so you’ll need an adapter if you’re a fan of eGo tanks. The head is also fairly large, about the same length of the battery tube. Along with the flat top, the control head naturally houses the brains of the device. On the exterior, there’s a color changing backlit LCD display and three gold colored metallic plastic buttons. The larger of the buttons is the fire button while the other two are the adjustment. 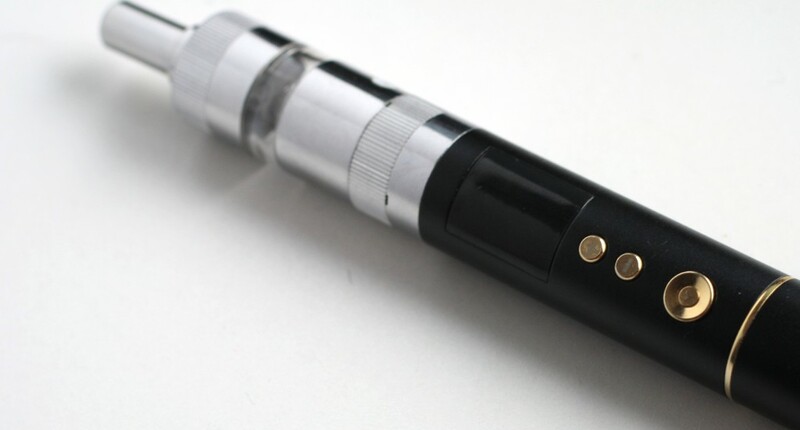 Like most good APVs on the market, you can choose between variable voltage and wattage. Similarly, you can even change the color of the display in a variety of colors including blue, white and purple. I’m going with the purple just to be different. Changing the various settings is achieved through the main fire button. To be honest it’s not terribly intuitive. You essentially double click the button to get to the first setting (voltage). Use the up and down buttons to adjust the voltage (3-6V) if that’s the mode you like. Double click again and you get to the LCD menu where you can pick your display color. The final double click takes you to the power setting where you can adjust wattage from 3-15 watts. A resistance meter is also included, but unlike the settings, you will see the resistance after a single click of the main button. After holding the button for a longer period (like when you’re actually vaping). A battery graph is also displayed so you always know how much power you have left. The rest of the body is fairly unremarkable with just a gold-colored ring between the head and body and the Sunfire logo silkscreened on the battery section. This is almost a feature since so many APVs try to go wild with the exterior design which can be distracting to some. I’m lookin’ at you, Innokin 134. Now on to the Sunfire Tank. 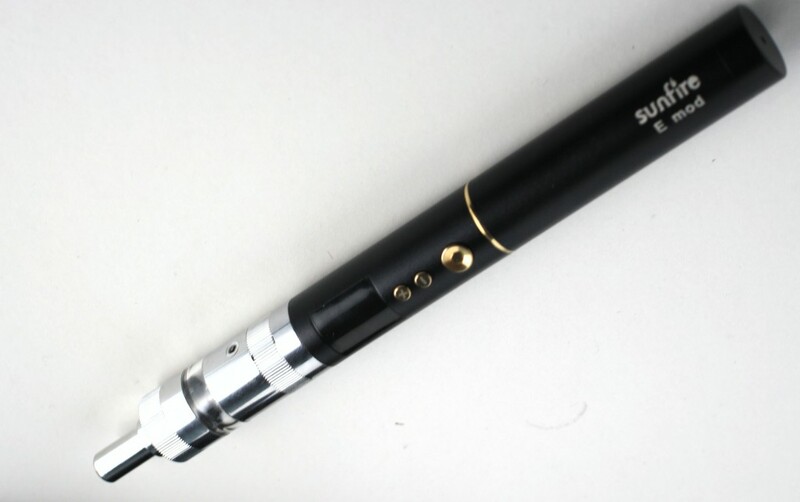 Clearly its designed for the E Mod since it fits perfectly on the top and is the exact same size as the APV. This gives the combined unit a nearly hybrid appearance. This tank is a dual bottom coil design that’s 1.5 ohm according to MJTech. However, mine is reading 1.9 ohm, so there is some variance. It’s a fairly straight forward design much like the E Mod itself. The top and bottom are flat and the plastic tank is covered along most of its body by oversized metal fittings. The top and bottom caps have ridges along the sides for easy gripping. What makes this tank more interesting is its adjustable airflow and mystery screw. Originally, I had thought the airflow was adjusted by the tiny screw on the side of the tank (they even include a itty bitty screwdriver in the kit). But, it turns out that you adjust the airflow by unscrewing or tightening the tank’s bottom cap. I still have no idea what the screw’s for. It’s like the three sea shells. Gaskets. Gaskets are what keeps the tank from just falling apart when you loosen the bottom cap. I know you were wondering. There’s a lot of gaskets in this design in both the bottom and top under those caps. The bottom holds the end cap with the replaceable dual coil head very snugly. It takes unscrewing completely and then pulling to free the bottom from the tank. 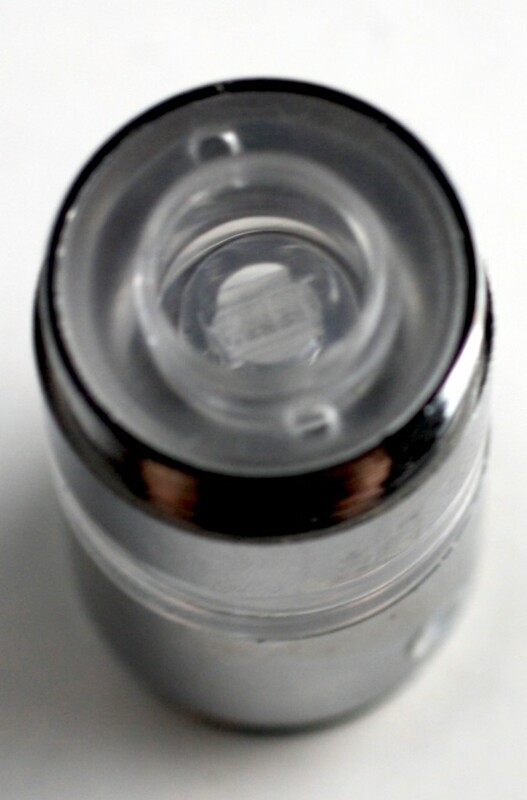 Aside from replacing the heads, you can also fill the tank from the bottom like most bottom coil tanks. There is one catch, however. Sitting on top of the head is yet another gasket, which is typical for most coil heads. The problem is that it has a habit of staying in the body when you remove the cap and head. This isn’t that big a deal, you just need to make sure everything is lined up when you put the cap back on. If you’re not comfortable with lining up the internal gasket, fear not, you can also fill this tank from the top. Removing the top cap reveals yet another gasket that covers the entire top of the Sunfire. Also on the gasket are two small pinholes. You old timers reading this probably shuddered in dread. That’s right, the holes are used to fill the tank with a syringe or a needle tip bottle. Fortunately, needle tip bottle caps are a thing these days, so if you have one of those, fill from the top, it’s just easier. Since we just covered filling, let’s move on to the rest of the Sunfire experience. As I mentioned in the design section, the APV and tank pair real well together. Of course you can run any tank you want on it, and the E did just fine with my Protank and other assorted tanks I use on a regular basis. Since the kit came with the Sunfire tank, I’ll just stick with that one, or we’d be here all night. First up is adjusting the airflow. It takes a bit to get used to the adjustment while the tank is mounted on the APV but it’s not hard once you figure out the trick. Hold on to the bottom cap with one hand and then twist the tank above with the other. You don’t need a huge gap or anything, as you unscrew the tank slightly you’ll see the air hole just expose it for a very airy vape or cover it to get a tighter draw. It’s not possible to completely block all airflow with the tank fully closed. You do get a nice, firm draw at that setting. The more open the airhole is the more vapor you’ll get, while a tighter draw tends to give you a more concentrated throat hit. The tank does produce consistently good vapor either way. I did find this isn’t the most power hungry tank in the world. Despite wattage going up to about 15, the sweet spot is closer to 10. That’s pretty consistent with similar tank designs in my experience. At 10 the vapor has good flavor and throat hit. It seems to be a touch cooler than other tanks at similar wattage. There’s no dry hits at this level, though at higher settings, serial chain vapers will find some harshness around the edges. In general terms, this is a solid middle of the pack performer. The fact the setup is smaller than the average mod will certainly be appealing to some. As for shorter battery life because a smaller battery, it’s not as bad as you’d think. The rating on the included 16650 is 2000 mAh, which isn’t that much lower than a lot of 18650s out there. The bigger problem might be finding replacement batteries. Since the kit includes only one, you’ll have to have something else to do while the battery is charging. For many people, 2000 mAh can last someone with reasonable usage the whole day. It will be interesting to see what pricing looks like once this thing hits the streets. It’s maybe not a head turning device, but it seems well built and reliable, kind of like a family sedan. The Sunfire E Mod by MJTech is not yet available in stores (vendors might want to check out their website). However, once it is, assuming the price is good, it would make an excellent starter kit for those making the jump to larger devices or as a second APV. About the biggest downside is the slightly unusual 16650 batter might be hard to find replacements for.